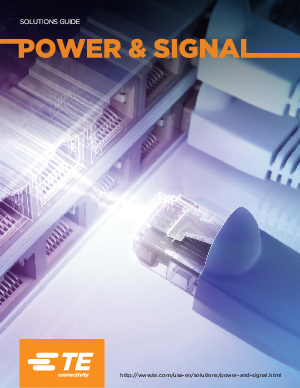 Whether you’re designing to efficiently charge-up a laptop, distribute power from a battery pack, keep signals uninterrupted in industrial machinery or a thousand other products, TE Connectivity offers reliable solutions that bring power & signal to your applications. TE Connectivity’s (TE) extensive connector and sensor solutions provide the essential connectivity you need for your daily interactions at home and in the workplace. Whether you are looking to design next generation display panels and internal LED lighting or you’re designing-in for the latest door alarms and pressure sensors, TE has the essential products you need for always-on connectivity.